With Halloween fast approaching I decided we needed a good scare. Scott didn't agree, especially since his first reaction is to "strike back" when the monsters come out. I finally convinced him to go to Netherworld with our friends Dave and Kristen, and as the icing on the cake, Chad came down for a visit just in time to go with us. Netherworld, according to the Travel Channel, is one of the best haunted houses in the country. And it was pretty good. 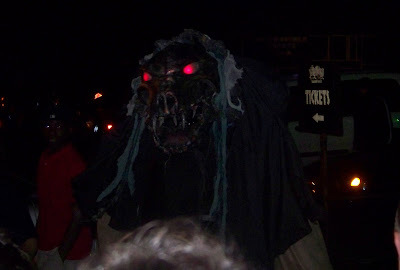 They had monsters scaring people while they waited in line and some really scarey stuff waiting for us once we got inside. They didn't allow camera's in the haunted house, but I snapped a few shots of us and some scary dudes out in the parking lot. I honestly don't think I could handle a haunted house in my old age...I'm not kidding that I might have a heart attack. I scare a little tooooo easy! It has been 15 years since I went to a Haunted House after being scared half to death. Glad you braved it out Scott. We must be siblings.